It’s been a long day. Work lasted sixteen hours. When I’ve had a day like this, I think about Efresina. Efresina was one of seven children born high in the Apennine Mountains in Eastern Italy. She lived in a snowy little village with mountain light and winter gales. From October to March it would snow, and just inside her humble home without heat or running water, there were four pairs of shoes. These four pairs of shoes served seven pairs of feet and helped bring those seven pairs of feet—and the children that stood over them—to school. It was a seemingly impossible situation, high in the mountains, bristling with cold; Yet, Efresina and her siblings beat the impossible and made their way to school. It puts my present situation in check. My head swirls with work. My lists of things I must do collide with the things I hope to do. The personal goals seem faded in the background as I check one email and then another. Hundreds pour in each day. Fire after fire rises, and with this phone call, and with that email, I put them out. I know deep down that I need to pick which end to burn the candle, and leave it at that, but I am learning and I am building. I wish I had two candles. I close my eyes and ignore my computer. I’m looking for inspiration back in the small foyer of young Efresina’s house. I see the snow out the window. It’s morning. It’s time to get to school, or maybe it’s time to look after the goats. Deft hands grab the shoes that are closest to her size. I wonder, did she wear the pair that were slightly too big or too small? What did she prefer? When Efresina was near nineteen, she married Leo, a bricklayer, and moved to San Lorenzo in Campo. Many women her age at that time would have just settled down to begin a family, but Efresina was different. She was a builder like the bricklayer she married, so she took an opportunity to learn a skill for which she had a deep passion—cooking and giving to others. Efresina began traveling several days a week to Rome in order to study under her uncle’s tutelage. Her uncle, an ocean-liner chef, taught her enough cooking skills to walk confidently into any kitchen. Soon she became an apprentice at a famous bakery in the Piazza Navona. I like to imagine Efresina in Rome, thrown in the middle of bustling thousands as they knock back espresso and complain about the doings of Parliament at Montecitorio. I also imagine her deciphering the recipes of everything she put in her mouth. 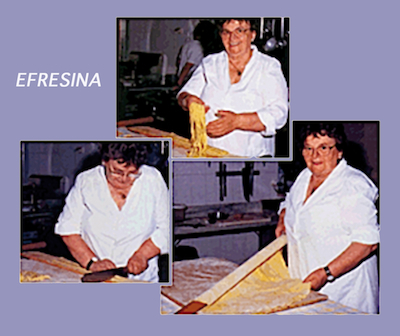 When Efresina returned to San Lorenzo in Campo, she began a small take-out business, making and selling lasagna, cannelloni, roast chicken, pastries and cakes. She also started a family. For the next twenty years, Efresina ran her small business out of her household. She became more and more successful; her food became more and more legendary. At the end of that twenty years, Leo built Efresina a professional kitchen, and surrounding the kitchen, a banquet hall, and above the banquet hall, a small hotel. The Hotel Ristorante Giardino opened on April 11, 1971 with two weddings and 450 guests. A family business was born. Yet, in that same year, Leo suffered an accident in his construction business, and was no longer able to work at his profession. He developed a deep depression, anxious of his future. What does a builder do, when he can no longer build? This time, Efresina gave to Leo, as he had given to her. She taught him how to make tagliatelle, tortellini, ravioli, pastries and gelato. Soon he was building famous wedding cakes and constructing cornetti. He found his builder’s hands once again. At 60, Efresina couldn’t resist an opportunity to study under Roger Vergé in Paris. Carrying the same willing spirit as she had at nineteen in Rome, she put herself to the task. The course was all in French, but that didn’t stop her. She wrote down recipes on whatever she could get her hands on, even her apron. Like most French chefs who treat you like nothing until you prove that you’re willing to always strive for excellence, Vergé’s treatment of Efresina began with a snub. But soon, she had him curious. He asked her to cook for him and his colleagues. She worked all day making the best of what Italian cuisine had to offer. 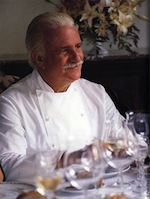 At the end of the meal, it was Vergé seeking to be taught. He asked her to stay on two additional weeks and teach his staff the secrets of Italian cooking, but Efresina missed Leo, her son and her kitchen. She headed back to San Lorenzo in Campo with a few more secrets in her apron, and professional respect beyond her Italian borders. I come back to the present. How can I complain of my situation when thinking of Efresina? The emails flying in to my inbox seem like small tasks. The fires that I must put out seem inconsequential. The hours I render seem like stepping-stones to new knowledge. She inspires me to keep building. She inspires me to take what I have, learn what I can, and keep going. From day to day, when we are looking to get by, it’s hard to think about building. 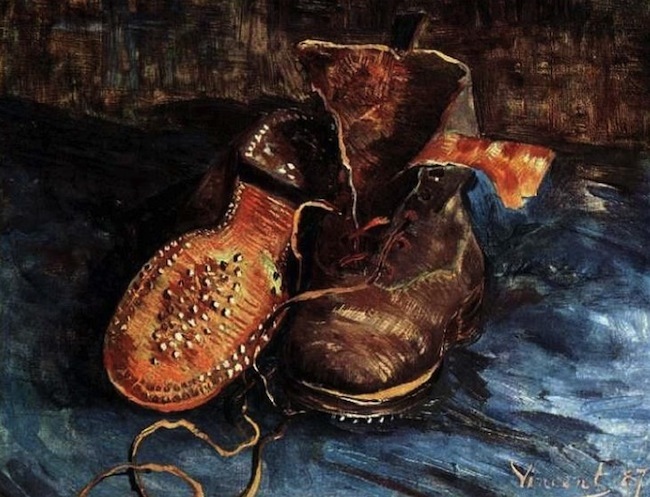 When we are dealing with our own “four pairs of shoes,” it’s hard to imagine that something great can come from limitation. Efresina’s story seems to show me the way. In 2006, Efresina passed away, but a large picture of her hangs over the kitchen in the Hotel Ristorante Giardino, and when you walk through this kitchen, smelling the aromas in the pots, you know that she is still there nudging the cooks to add a bit of salt, or to serve the meat soon, before it loses it’s shine. Now that I think about it. Efresina probably didn’t pay much attention to which pair of shoes she put on her feet as she headed out the door. I doubt these thoughts crossed her mind as they do mine. I bet, for Efresina, she was glad it was her day for school, and I can see her, very matter-of-factly, placing the shoes on her feet and marching out into the cold without much thought of how her feet felt. 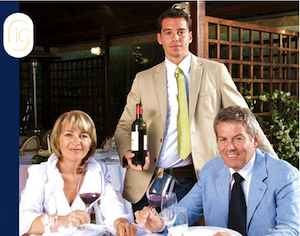 Today, Efresina’s son Massimo Biagiali runs the Hotel Ristorante Giardino with his wife Patrizia. He is also a builder, and has developed a highly enviable wine cellar. They have a son Paulo. The executive chef, Luciana, was nineteen when she arrived on Efresina’s door. After thirty years following Efresina’s teaching hands, she keeps Efresina’s cuisine alive. just want you to know how marvelously you’ve captured this family. I am a cousin from Toronto, Canada. You brought tears to my eyes. Give Lenny a big kiss!! Hi Elise. I read your blog and loved it! I am also a distant cousin from Toronto and actually had the honour and pleasure of spending the summer of 1981 with Claudia DaRiva (zia Giuliana’s daughter) at the hotel. I was turning 17 and Paolo was just a baby. We helped out at the hotel under Massimo and Efresino and it was the best summer of my life!! Your blog brought back many many memories for me! Although we are all scattered in different parts of the world it is wonderful that we can all keep this connection. I don’t know if Lenny has told you but he has been to Toronto many times and spent time with us. We still remain close with his mother Flavia, Patrizia and Adamo. Your blog has just connected us even further and if opportunity strikes, it would be great to meet you one day. From the bottom of my heart, thanks for putting together such a wonderful memoriable blog. All the best! Mara Morresi-Miele.